Sigmund showing his love of the trumpet. Photo: Pippa Zammit Cutajar. The Casino Maltese in Valletta will next week host a classical concert under the baton of Sigmund Mifsud. Appropriately entitled Sigmund in a Classical Mood, the concert will feature among other pieces, Haydn's Trumpet Concerto in E flat major, virtuoso pieces such as Variations on a Neapolitan theme, contemporary works from Allen Vizzutti and Maurice Ravel, and a concerto for trumpet by Harry James. Renowned pianist Rosetta De Battista will accompany Mro Mifsud, while guest performers include saxophonist Joseph Vella, Roderick Bugeja and Jesmond Azzopardi on euphonium, Dennis Camilleri on the trombone. Soprano Denise Mulholland will also take part. In the last few years, Mro Mifsud has directed a number of musical events involving mainly pop music, such as the National Orchestra Goes Pop and, more recently, the Manoel Theatre Swings Concert. 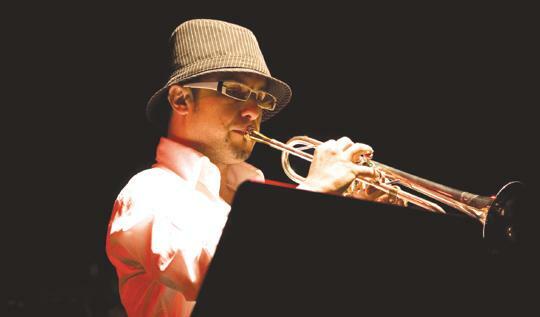 This time, Mro Mifsud will show his other passion, not only that for classical music, but also his love of the trumpet. The recital, being held under the patronage of Cav. Dott. Tonio Portughese, is sponsored by HSBC Malta plc, the Malta Council for Culture and the Arts, Orienta and supported by Ikona Artworks. Sigmund in a Classical Mood will be held on Saturday, April 5. Dress code is smart (jeans are not allowed). A limited number of tickets at €12 are available from www.maltaticket.com, Agenda Bookshop, Newskiosk, Exotique, Bookends and Vodafone outlets, or by calling on 2784 2538.